At NEMA Boston, the amenities are curated to optimize your lifestyle with thoughtfully designed and programmed spaces for entertainment, wellness, and productivity. NEMA’s amenity collection spans the entire top floor of the tower, providing incredible views for all NEMA residents to enjoy. Whether hosting a private sunset party, enjoying a dip in the pool, or cheering for your favorite sports team, at NEMA, entertainment options abound. The Lobby Lounge provides laptop spots and seating for a variety of group sizes, in addition to an indoor fireplace and a DJ turntable for resident events. Adjacent to the NEMA Boston Lobby is the Garden pocket park, a dedicated green space complete with an herb garden and a fire pit, offering residents a private respite in the heart of Seaport. The view into the Garden can be enjoyed through the floor-to-ceiling glass wall in the Lobby Lounge, which was conceived so that nature would always greet residents with a warm welcome home. To unwind at the end of a busy day, take a plunge in NEMA's heated Skyline Pool located at the top floor of the tower and framed by our city's beautiful views. The Arcade is NEMA's private game lounge, featuring a bar and a pool table, along with a 98" TV with options to watch four games at once or to enjoy your favorite team on one impressive screen. The Chef's Kitchen offers the opportunity to host and entertain in a professionally appointed culinary setting, or to master your cooking skills during one of NEMA's resident events. The Media Lounge is NEMA's own private movie theater with modular seating. The lounge is also equipped for gaming and virtual reality. In NEMA's Skyline Lounge, the Seaport and downtown Boston views, a cozy fireplace, and comfortable seating create a welcoming private space for residents to enjoy, whether the mood is to relax solo or stay social. Thoughtfully curated amenities for your custom fitness routine. Expansive floor-to-ceiling windows frame NEMA's Fitness Center, creating an inspiring space filled with natural light and boasting spectacular views from the Boston Harbor to Castle Island. The Fitness Center features premium state-of-the-art strength training, functional training, and cardio equipment, including Peloton bikes, Woodway treadmills, and the Technogym SKILLRUN. NEMA's private Yoga Studio offers group fitness classes and private instruction by certified fitness professionals. Working from home at CoWork, bringing your best ideas to life in the Creators Suite, or taking care of furry friends—NEMA Boston offers a new way to think about home. Designed with the Seaport's "innovation hub" status in mind, NEMA's Creators Suite features a leading-edge equipment collection, custom-curated for your peak creativity and productivity. 3D scanning and printing as well as coding and design stations are now an elevator ride away. With downtown Boston views as the backdrop, NEMA's CoWork is designed for optimal convenience. The space offers screen-sharing capabilities and individual work stations. To streamline your business logistics, NEMA offers two private Conference Rooms, which can be reserved via the mobile app or reservation tablet. Each room features screen-sharing and videoconferencing capabilities. 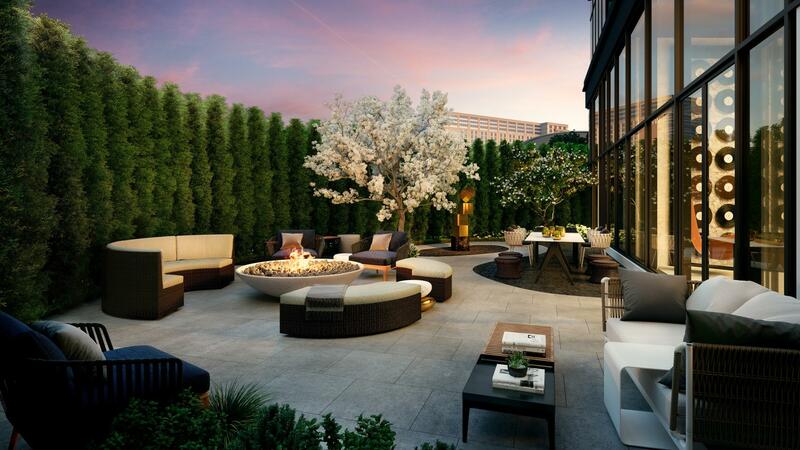 Complemented by the stunning views of the Boston skyline, this outdoor lounge offers fire features, comfortable seating, and TV-equipped barbecue grilling stations that may be reserved for private use via the app. A green, outdoor rooftop feature for picnics and sunset views. Take a dip in the heated rooftop plunge pool and enjoy the spectacular view. A high-tech workspace featuring equipment for 3D printing and scanning, coding, and design work. Boasting incredible Boston views through expansive floor-to-ceiling windows, the Fitness Center features premium state-of-the-art strength training, functional training, and cardio equipment, including Peloton bikes, Woodway treadmills, and the Technogym SKILLRUN. A dedicated yoga and meditation space with professional instructors to guide your practice. Treatment rooms for massage and other spa services. Cooking demonstration space for hosting, entertaining, and culinary exploration. A private movie theater with modular seating, gaming, and VR consoles. NEMA’s private game room and sports bar. Resident lounge with Boston views, a cozy fireplace, and comfortable seating. NEMA’s shared workspace with downtown Boston views. Two executive-style rooms with screen-sharing capabilities, both of which can be reserved via the app or tablet. NEMA’s private pocket park with lounge-style seating, a fire feature, and a micro herb garden. A station for residents to pamper their four-legged significant other. Indoor and outdoor play areas for NEMA’s furry residents to escape the Boston winters. Fully equipped with cold storage for perishable deliveries; we will sign for packages and either store them for pick-up or arrange for in-unit delivery. A Seaport-inspired Lobby with custom art pieces, a DJ turntable for resident events, and 24-hour concierge service.